The Master of Science in International Accounting, Audit & Control is designed to shape the participants’ understanding of contemporary financial reporting and advisory functions needed for the real business world. The program is offered on a full-time basis and consists of 2 consecutive semesters of courses (September – May) followed by a professional experience (from June onwards). The curriculum contains a wide range of core courses on elementary and advanced issues in financial reporting and management Control. It also features a series of elective courses allowing students to specialize in different areas within the domain of accounting, Audit & Control. The MSc in International Accounting, Audit & Control is aligned with prerequisites of international professional accountancy institutes (e.g., ACCA, CIMA and IMA) and students benefit from the program’s dedicated faculty which balance relevant academic and business experiences. Describe how ratio analysis and other techniques can be used to model and forecast earnings. Identify the key provisions of and differences between income tax accounting under IFRS and U.S. GAAP. Initiate and control the risk management process. Define strategies to mitigate risks on project objectives. The course intends to provide the students with all the necessary tools in order for them to understand the nature and rigour of management consulting and apply skills in management consulting processes; to identify the consulting sector characteristics and features for future employment; to recognise, analyse and negotiate consulting opportunities; to demonstrate problem solving, design and other analytical skills and learn overall consulting process skills; to apply the economics of management consulting to set rates and compensate consultants; to generate insights with meaningful conclusions and recommendations. Apply theory to practice by emphasizing how global businesses can potentially contribute to the creation of positive social change and to the development of a sustainable future. Coping with ethical dilemmas in CSR. This course is based on a business management simulation game that integrates the functional areas of production, marketing, logistics, finance and strategy. It increases participants’ awareness of operating a company from a general management perspective. At the end of the course, the student should be able to understand how to design and implement a strategy for different kinds of markets; interpret and forecast market situations and financial results and translate them into goal-oriented decisions; analyse problems, find solutions and take decisions in a context characterised by changes; recognize the interactions among the various companies and external stakeholders in a complex and interrelated environment.In this business game, teams will develop and execute strategies for their simulated company operating in different markets with specific customer behavior, cost structures, and currency fluctuations. They will be required, in several rounds of the game, to make operational decisions and overcome various business challenges. Design and implement well-structured databases to enable business processes. At the end of this course, the students will have a good understanding of a global IT audit framework. The students will be able to realize a preliminary evaluation of risks related to an information system, and assess the risks related to the systems security, the systems adaptability, the activity continuation plan and management of accesses. They will also have the opportunity to: evaluate the coverage of the risks related to an information system by the appropriate criteria; prepare the right recommendations to be implemented from the identified risks; and reproduce an IT audit interview in a real business context. The student should also be able to identify advanced data analytics techniques through real-life examples (clustering, link analysis, tag cloud and text mining, etc.). In addition, the participant should be able to distinguish the main steps in a forensics data analytics approach and suggest the right utilization for the right situation. Similarly, the student will be able to: define the right questions starting from the available data; collect and pre-process data; review models estimations and interpretation. The students should also be able to use some basic methods packaged in data analytics software’s like R.
Understand the company’s financing decision (debt vs. equity) and its effect on firm value. Understand the significance of taxes on financing decisions and its effect on firm value. Understand the company’s optimal capital structure in financial distress and bankruptcy. Understand the effect of managerial incentives on financial decisions and firm value. Understand the trade-offs in pay-out policies and their significance to investors and firm value. Interpret he linkage of (supra-national) institutions [e.g., legal, governmental, and societal] to market functioning. Understand the impact of accounting harmonization initiatives and its effect on reporting outcomes. Comment on the need for IFRSs for SMEs. Evaluate International Public Sector Accounting Standards (IPSAS) and comment on the reasons why governments have been slow to adopt the standards. Discuss and evaluate integrated reporting and other narrative forms of reporting. The course will look in detail at the key tax provisions affecting the treatment of international business operations. 4-6 month internship or consulting project anywhere in the world. 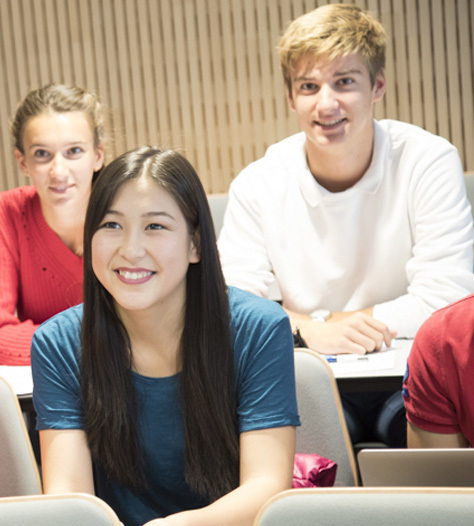 The IMA (Institute of Management Accountants) Higher Education Endorsement Program is a program that identifies business curricula that meet the quality educational standards required to enable students to earn the CMA® (Certified Management Accountant) designation, and it helps other schools develop such programs. IMA’s globally recognized CMA® (Certified Management Accountant) program is a relevant assessment of advanced accounting and financial management knowledge in critical areas such as financial planning, analysis, control, and decision support. For more information about the CMA certification program, please visit www.imanet.org/certification. The evolution of the accounting profession is fundamental for the program.The Data Analytics course allows participants to get involved with advanced data analytics techniques through real-life examples (clustering, link analysis, tag cloud and text mining, etc.). Participants get acquainted with the main steps in a forensics data analytics approach and gain knowledge on the use of some available data analytics software.